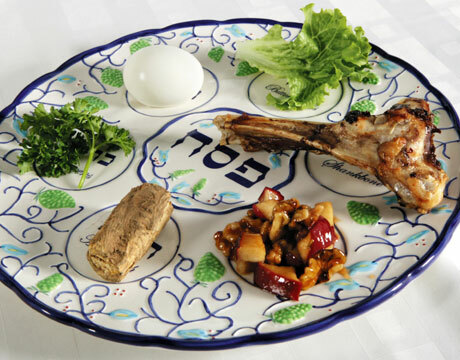 Tonight starts the beginning of Passover, don’t feel like cooking a full seder? Enjoy a traditional and delicious Seder and time with family and friends at Fairway Market’s second annual Passover Seder on Monday, March 25 and Tuesday, March 26 at 5:30 pm in the Upper West Side Café & Steakhouse (2127 Broadway). Let Mitchel London, Fairway’s Chef du Cuisine, and his staff do all the work so you can relax and be served a full menu of traditional holiday foods, including chicken soup with matzo balls, chopped liver, braised brisket, roast chicken in pan juices, potato pancakes, macaroons, ambrosia and more. A Haggadah (the text read during the ritual meal which tells the story of the Israelites liberation from slavery in Egypt) and a Seder plate will be provided for each table. For reservations, please call (212) 994-9555. Tickets are $45 per person, and $25 for children 12 and under. In celebration of Passover, Bill Telepan will serve a Seder-style dinner at his Upper West Side restaurant on Mon/March 25 & Tue/March 26. Bill will offer his take on the traditional Seder meal with a four-course menu of flavorful dishes such as spring vegetable soup with matzo balls & dill oil and hanger steak and brisket. Pastry chef Larissa Raphael will end the meal with pineapple-lemon sorbet and flourless chocolate cake. Reservations open on Thu/Feb 28, and can be made, here or (212) 580-4300. March 25th and 26th, Sarabeth’s Tribeca (339 Greenwich Street) will be offering a special Passover menu by Executive Chef Lee Scheffler. To start, enjoy a bowl of light yet flavorful Matzo Ball Soup filled with hearty vegetables ($9). For the entree, try the juicy Lamb Chops accompanied with a potato pie and asparagus and cooked in a red wine sauce ($31) or the Stuffed Whitefish atop Matzo farfel with glazed carrots and red beet horseradish ($24). Finish off the meal with Sarabeth’s famous Flourless Chocolate Cake ($8.50). BLT Fish (21 West 17th Street, 3rd Floor) will also offer a few specials by Executive Chef Amy Eubanks. Chef will prepare a Salmon Belly with freshly grated horseradish, parsley and celery ($14), as well as a dessert of roasted apples and walnuts with cinnamon ice cream ($11). While it is not a special, the made-for-two Loup de Mer with yellow beets and citrus sabayon ($32 per person) can certainly be a great Passover alternative. This entry was posted in holidays, nyc, Sara Monica, SCBD, Small Chick Big Deals and tagged jewish holiday, passover, passover dinner, sara monica, scbd, seders, small chick big deals by smallchickbigdeals. Bookmark the permalink.